The Swedes got a penalty kick awarded after video review and made it count. 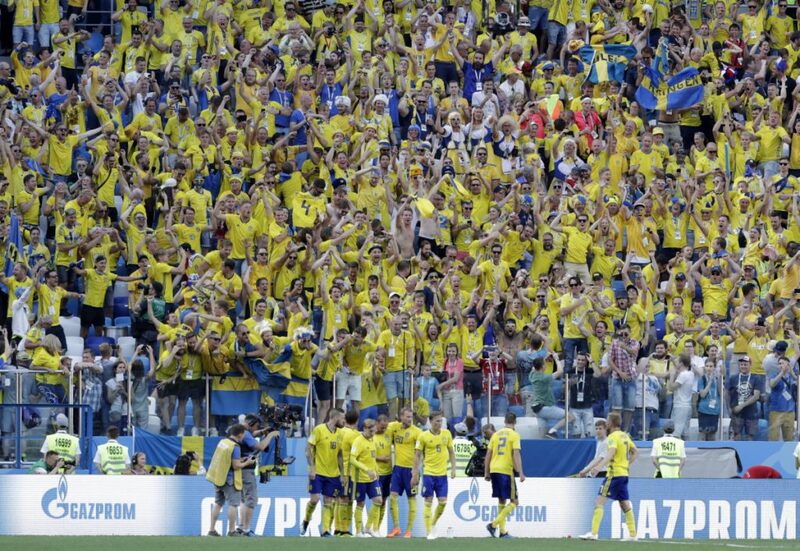 NIZHNY NOVGOROD, Russia — Sweden got the break it needed from the video review system, and team captain Andreas Granqvist didn’t waste the chance. Granqvist slid his penalty kick into the bottom right corner of the net in the 65th minute to give Sweden a 1-0 victory over South Korea on Monday at the World Cup. The Swedes were awarded the penalty after referee Joel Aguilar consulted a video screen on the sideline following an appeal by the Swedish players. Aguilar had originally waved play on after South Korea substitute Kim Min-woo collided with Viktor Claesson in the area. But he changed his mind after taking another look, deciding Kim had tripped Claesson as he tried to clear the ball in a sliding tackle. It was the third penalty to be awarded because of a video review at this year’s World Cup. France and Peru have also benefitted from the technology, though the Peruvians missed their penalty kick. Sweden had been the better team for much of the game – and finished with 15 attempts on goal to South Korea’s five – but couldn’t beat goalkeeper Jo Hyeon-woo until the penalty. Sweden was making its return to the World Cup for the first time in 12 years. It is now tied for first place in Group F with Mexico, which beat Germany 1-0. The Swedes will next face the Germans on Saturday, while South Korea plays Mexico on the same day. Before Granqvist’s penalty, Sweden showed most of the attacking intent at Nizhny Novgorod Stadium. Marcus Berg had the best chance of the first half when he was put clear on goal in the 21st minute and had his close-range shot blocked by the right leg of Jo, South Korea’s third-choice goalkeeper. Jo was surprisingly made a starter by coach Shin Tae-yong, who also gambled on a three-man attack of Son Heung-min, Hwang Hee-chan and 6-foot-6 striker Kim Shin-wook. South Korea, which has won only two World Cup matches since its incredible run to the semifinals in 2002, had a chance to level in injury time but Hwang Hee-chan put a header wide from in front of goal. It wasn’t a flowing performance from Sweden, but securing the win will come as a huge relief to coach Janne Andersson and his team. Sweden couldn’t afford to miss the chance against a struggling South Korea team with tough challenges against Germany and Mexico next. South Korea must pick itself up to face a Mexico team high on confidence after its spectacular win over Germany. Sweden: Granqvist was inspirational for Sweden, but the team still showed a lack of skill up front and that needs to be addressed before the match against Germany. South Korea: Shin had high hopes for an attacking trio of Son, Hwang and Kim, but it didn’t work well enough. Son, South Korea’s best player, switched from the left wing to the right and then back to the left again in an attempt to get something going.